Researchers at the University of Sussex have developed a graphene-based sensor with the potential to prevent sudden infant death syndrome (SIDS) cases. 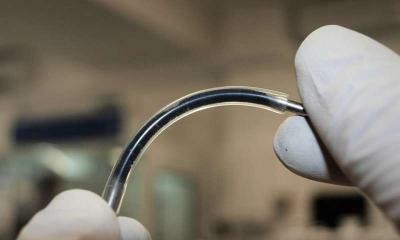 The sensor is shaped like a flexible rubber tube filled with a solution of water, oil and particles graphene. the sensors were said to be the most sensitive liquid-based devices to have ever been developed. Utilizing graphene's conductivity, the solution inside the tube conducts electricity. When the tube is stretched by even a tiny amount, the conductivity also changes and this change can be detected, indicating that movement (such as the rising and falling of a breathing person's chest) is occurring. Dr. Matthew Large, lead researcher on the project, describes the new development: "What we've done is similar to how you might make a salad dressing; by shaking together water and oil, you make tiny droplets of one liquid floating in the other because the two don't mix. Normally, the droplets would all collect together and the liquids separate over time, like the droplets in a lava lamp. We've resolved this by putting graphene in. The graphene, which is an atom thick, sits at the surface of the droplets and stops them from coalescing." Dr Large continues: "What's quite exciting about this new type of conductive liquid is how sensitive it is to being stretched. When the graphene particles are assembled around the liquid droplets electrons can hop from one particle to the next; this is why the whole liquid is conductive. When we stretch our sensors we squeeze and deform the droplets; this moves the graphene particles further apart and makes it much harder for the electrons to hop across the system. The sensitivity of this new kind of strain sensor is actually much higher than a lot of existing technologies, and it is the most sensitive liquid-based device ever reported by quite a significant margin." The idea is to have this ultra-sensitive sensor collect and relay the data wirelessly and non-invasively, with no heavy gear that might fall off or disturb the child's movements. A prototype has been created and the scientists are in contact with commercial sponsors to fund further research so that the product can be brought to market. University of Sussex's Professor Dalton says: "Using the conducting liquid emulsions we have developed, we will produce cheap, wearable sensors based on graphene. The devices will be comfortable, non-invasive and can provide intuitive diagnostics of breathing and heart rate. We will eventually have a suit that the baby can wear which will read-out all vital information wirelessly. We hope to see this made available within two to four years... In the laboratory we have created a sensor that has the potential to drastically improve early detection of life-threatening symptoms such as sleep apnea or cardiac arrhythmia, where constant monitoring with conventional equipment is challenging outside of the hospital environment."